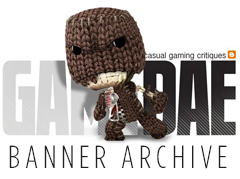 I am a huge comic book fan, have been for as long as I can remember; so it stands to reason that I would be attracted to superhero video games. This genre has a pretty ugly track record. Most superhero games are created to supplement a major motion picture and, as every gamer should know, that does not make for a good game. With the advent of the latest generation of systems superhero games have greatly improved with a few standout performances. Spider-man Shattered Dimensions, the latest in the Spider-man franchise of games, takes the often formulaic game play and adds some new twists and turns. It's called Shattered Dimensions because the story crosses over time and different universes to feature Spider-man in all his different incarnations working together. 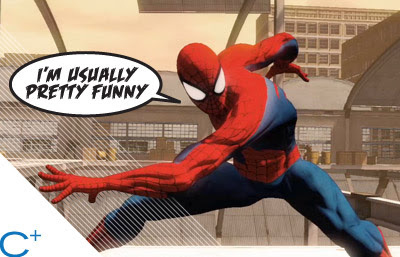 There is, of course, your Amazing Spider-man which features graphics that are "animated looking" with clear outlines and bright colors. The levels played as the Amazing Spidey are mostly acrobatic. Spider-man Noir is a look at Spidey in the past. The Noir levels are colorless and very dark and moody. These levels focus on stealth game play. Spider-man 2099 has flying action with some grand descents that you must navigate through. As you may have guessed it takes place in the future - the year 2099. The future levels are very metallic and shinny. The final Spidey is the Ultimate Spider-man which takes place in a separate Marvel U. called the Ultimate Universe. 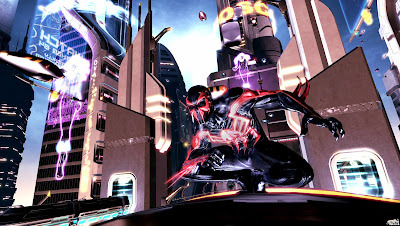 Ultimate Spidey (in this story) is still wearing the "black suit" which is actually an alien symbiote (long story) these levels focus on fighting and "rage" mode. Lets start with the good. The controls stay fairly consistent depending on which Spider-man you are controlling with an additional specialty for each one. Fighting is great with an expanding arsenal of moves at your disposal. Swinging and aerial maneuvers are easy and fun to pull off. At any time you can hold down a button and dodge virtually anything with Matrix-quick reflexes just like Spidey would. Swinging, using your web shooters, is a blast. Even the over arching story with the four different points of view is interesting. The problem is the quality of everything is is spotty. This game has some of the best cut scenes as well as some of the worst I have ever seen. While a few key plot movies are animated in amazing CG others come off as unfinished with highly rendered images that completely lack animation. We are talking panning arms up and down and twirling eyes, people. The levels and game play are repetitious and get tired fast. You enter each level, fight some minions, then the level boss, he escapes and you chase, you save some people then have another boss fight--every level. I'm all for being a hero and saving the people but half way through I started to just hate those same helpless people. The boss fights are memorable but often too easy and predictable. Fighting the level boss features a twist on the popular "quick time event" action. After some quick button pushing you engage the boss in a neat Punch-Out style, fisticuffs action. The story arc is told in three acts but largely fails with not enough substance to warrant the repetitive levels. A nice addition is some non-villain characters: Deadpool and Silver Sable. Although in true comic fashion they have to fight before getting along. Shatter Dimensions is good for completion-ists and trophy hunters. You are encouraged to play each level on all three different difficulty settings each with their own unlockable bonuses. 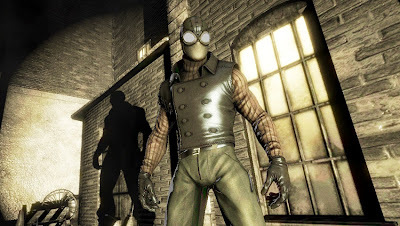 Unlockables are additional costumes from other famous spider stories and preliminary art. Replaying levels also gives you a better chance of unlocking your "web of destiny" achievements. With each achievement unlocked you are awarded points which you can then in turn use to buy more fighting moves. The more difficult levels require some of these more powerful unlockable attack moves. 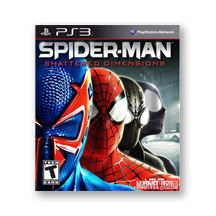 I did enjoy Spider-man Shatter Dimensions, especially the final battle. It was a satisfying "all you have learned" romp that will have you shaking your controller then basking in glory. However, just like my relationship with the printed version of Spider-man, we have had our good times but I've had to pass it up from time to time. I'm glad I picked up Shattered Dimensions but I wouldn't fully recommend it. There are more Spider-man games than hand washing on the Food Network. There is a Mangaverse Suit code too but I haven't been able to make it work.